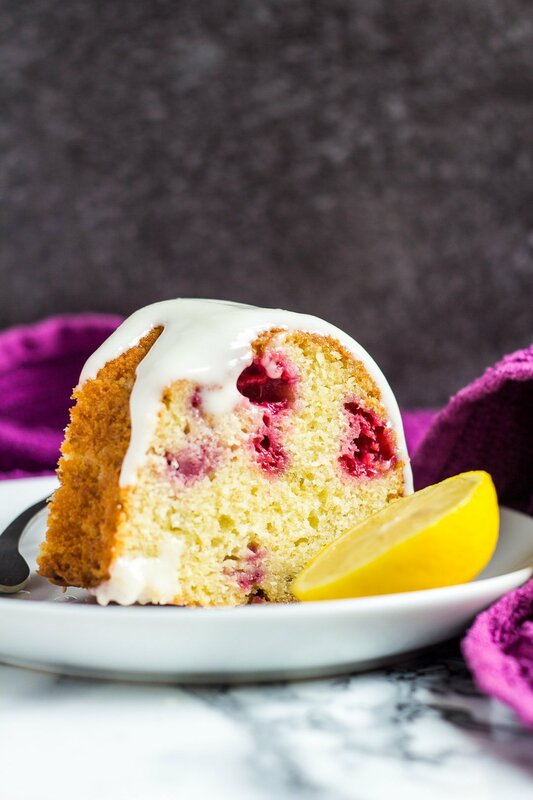 Lemon Raspberry Bundt Cake – Deliciously moist and fluffy lemon-infused bundt cake stuffed with fresh raspberries, and drizzled with a lemon cream cheese glaze! I am loving the flavour combination of lemon and raspberries lately. 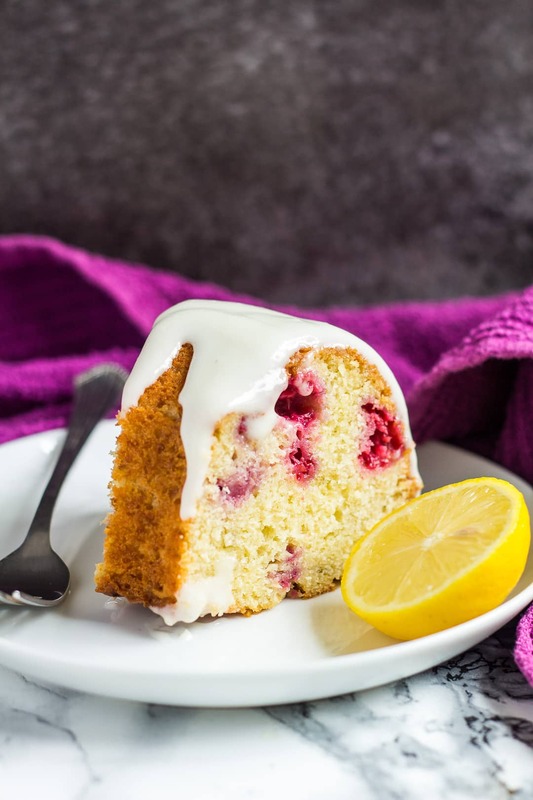 It makes for such a flavourful and summery dessert, and today I bring you another one for you to enjoy – my Lemon Raspberry Bundt Cake! I’ve made a few lemon raspberry desserts this summer, like my Raspberry Swirl Lemon Pound Cake, and Lemon Raspberry Layer Cake. Have you tried them yet? 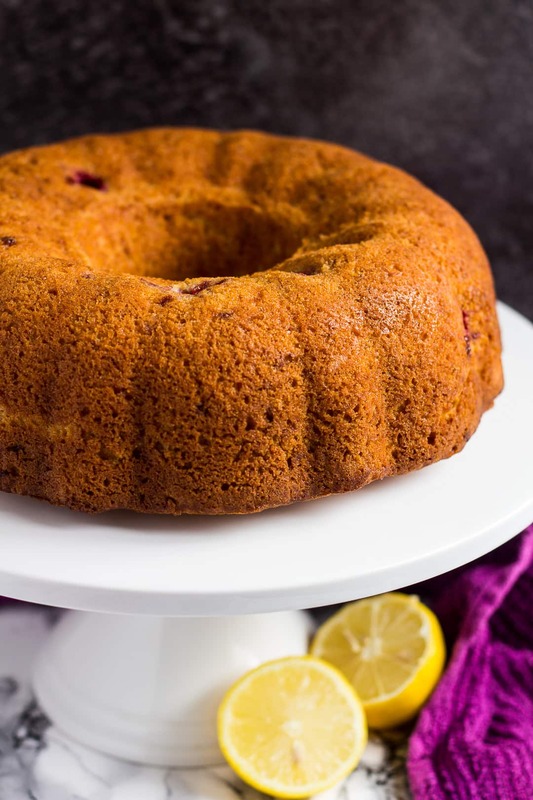 This lemon raspberry cake is an incredibly moist and fluffy bundt cake that is infused with lemon, and stuffed with juicy, fresh raspberries. For the topping, I used a deliciously sweet lemon cream cheese glaze. It pairs perfectly with this cake – you’re gonna love it! 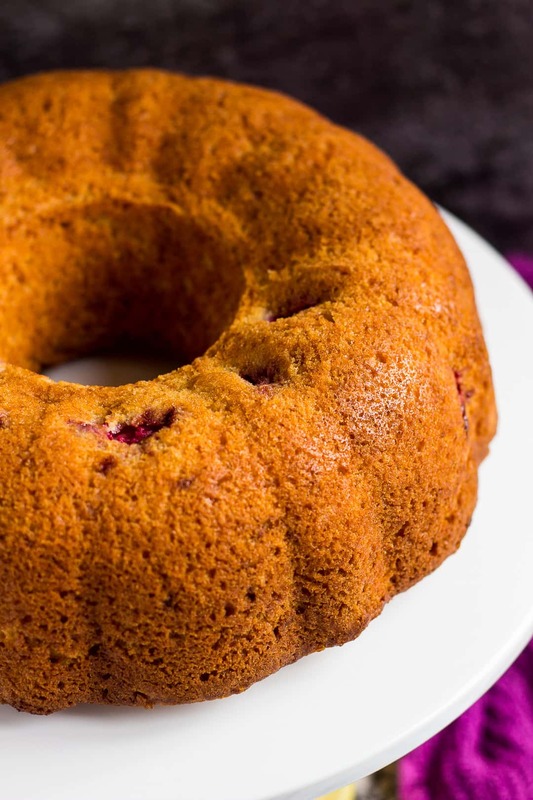 To make this bundt cake, simply whisk together the flour, baking powder, baking soda, and salt. Set aside. In a separate bowl, whisk together the eggs and sugar until combined. Add the melted butter, yogurt, and lemon extract, and whisk until combined. Fold in the dry ingredients, then gently fold in the raspberries and lemon zest. Pour the batter into a well greased 10-inch bundt pan, and bake for 45 – 50 minutes or until a toothpick inserted into the centre comes out clean. Let cool in the pan for 10 minutes before inverting the cake onto a serving plate or cake stand. Allow to cool completely before glazing. For the glaze, whisk together the icing sugar, cream cheese, lemon extract, and milk until completely smooth. Spoon or drizzle over the cooled cake. Try these bundt cakes next! 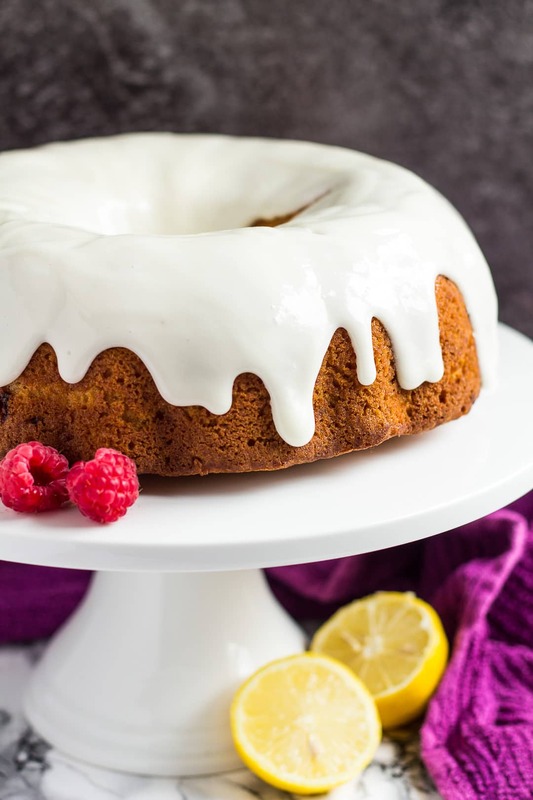 Deliciously moist and fluffy lemon-infused bundt cake stuffed with fresh raspberries, and drizzled with a lemon cream cheese glaze! Preheat the oven to 180C/350F/Gas 4. Grease a 10-inch bundt pan, and set aside. Whisk together the eggs. Add the sugar, and whisk until combined. Add the melted butter, yogurt, and lemon extract, and whisk until combined. Fold in the dry ingredients. Gently fold in the raspberries, and lemon zest. It's fine if the raspberries start to break up. Pour the batter into the prepared pan, and bake for 45 - 50 minutes or until a toothpick inserted into the centre comes out clean. Let cool in the pan for 10 minutes before inverting the cake onto a serving plate or cake stand. Allow to cool completely before glazing. 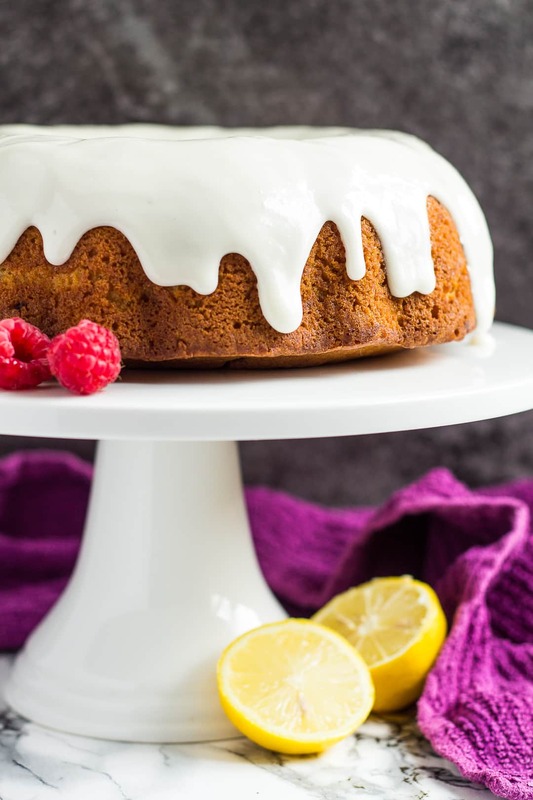 Whisk together the icing sugar, cream cheese, lemon extract, and milk. Add more icing sugar if too runny, or more milk if too thick. The icing should be fairly thick, but pourable. Spoon or drizzle over the cooled cake, and serve. *Make your own cake flour! Weigh out 3 cups (375g) of plain/all-purpose flour, remove 6 tablespoons, and replace with 6 tablespoons of cornflour/cornstarch. Sift well. **Don't use lemon juice in place of lemon extract because it's not strong enough, and the acidity can alter the overall results. Leftovers can be stored, covered, in the fridge for up to 2 - 3 days. You can bake this cake 1 day in advance. Allow to cool completely, then cover tightly and keep at room temperature or in the fridge until ready to glaze and serve. This cake also freezes well for up to 2 months. Thaw overnight in the fridge before serving. You’ve combined two of my favourite flavours into one beautiful cake! Love the thick icing on the top, too. Bet it adds a wonderful contrasting sweetness to the tart lemon and raspberries. YUM! This combination sounds absolutely wonderful, especially in a bundt cake! What a delicious looking cake, would go nice with a cup of coffee. Oh wow! Love that lemon cream cheese glaze. Such a beautiful cake with the pieces of raspberries. Okay, gorgeous AND delicious? You’re making all the other bundt cakes jealous over here! Gotta try this soon! You are seriously the Queen of Bundt Cakes, Marsha!! Every single bundt cake that you’ve shared is just incredible. I seriously can’t wait to see more (especially for the upcoming holidays)! 🙂 Pinned, of course. Hugs! It’s absolutely stunning. So bright and happy, both in flavor and presentation! I baked this cake yesterday and it turned out more dense than fluffy. The flavor was great however. I baked this cake and it wasn’t fluffy, it turned out to be very dense! Is it the greek yogurt that makes it dense? In order to have a more fluffy cake what would you suggest? The falvour was marvelous and the glaze was to die for! Hi Stefania! I’m sorry your cake didn’t turn out as fluffy as you’d hoped for. Yogurt does make for a moister cake, so would add to the heaviness of the cake. Over-mixing the batter can also result in a dense, rubbery cake. Over-mixing acts on the gluten in the flour and will make cakes dense instead of soft and fluffy. 1. Try using 1/2 cup yogurt next time instead of 1 cup. 2. Avoid over-mixing the cake batter. 3. Use an oven thermometer to make sure the temperature is correct. 4. Avoid over-baking. Cover the cake with foil half-way through baking to avoid excessive browning, which could result in a drier cake.